Here is the first installment in a collection of photographs that I took during a five day journey to the Western Cape of South Africa and back to the land of Brooklyn, NY. I was honored to be invited down for the weekend to help with and host the Third Annual Trash to Treasure Festival of Transition at the Greyton Green Park. Greetings DO School Friends and Followers! My name is Joseph Stodgel. I am originally from the high-desert town of Santa Fe, New Mexico, although have spent a lot of the last decade traveling and am slowly but surely moving to the forests of California where I have been residing as of late. I grew up in a musical family and surrounded by the arts in Santa Fe and these led me to cultivate a fierce creativity of my own which I express daily in written, painted, sung or cooked forms. Into my teenage years I began to seriously question the status-quo way things are done in our modern society and cultivate a healthy suspicion to and deep seated disagreement with all things “conventional” such as conventional education, agriculture and waste management to name a few. In 2005 as I neared the end of my time in High School, I was gifted a magnificent opportunity: to leave the United States on a trip to Indonesia. The Bali Art Project was designed to share the world of travel with young Americans, and by the end of the 5-week journey I had a fierce determination to see more of the world and its diverse places, peoples and cultures. This led to years of travel and the visitation of more than 20 countries. At the same time that travel became the greatest education that I could’ve asked for, I too recognized the value in organized times of study with organizations and institutions. Over the years I pursued a variety of higher-education programs such as a Dual Certification in Polarity Therapy and Massage at the New Mexico Academy of Healing Arts, a year at the University of Hawaii, and a year abroad with the Living Routes organization at the Findhorn Foundation in Scotland and the Auroville Community in Southern India. In 2009 when studying in Scotland I learned about the Schumacher College in England, and in 2011 after returning from a two-year trip around the world I decided to apply for their Masters Degree program in Holistic Science. I was accepted and spent the following year studying fields such as the scientific methods and phenomenology of Goethe, Gaia Theory, complexity and systems science, as well as the new approaches to science and physics found in the work of quantum physicists and others such as Rupert Sheldrake and Nassim Haramein. With my dissertation work I chose to readdress a previously studied inquiry of intense interest for me: what do we do with all of the trash? Just before I left for an applied period of three months study and work in South Africa, I learned about the missing piece to the study of upcycling which I had become so passionate about: a plastic bottle stuffed with every waste material that cannot be reused, composted, recycled or safely burned, and used as an alternative to wall-filling insulation in constructions. I dedicated myself to this concept and practice of the eco-brick, and carried it with me to the rural areas of the Western Cape where I was to live and work. The towns and communities of Greyton and Genadendal are facing a variety of issues such as community disintegration, poverty, inequality, pollution, ecological illiteracy, environmental disassociation, and dysfunctional waste management systems. I spoke with many people about the potential of eco-bricks and upcycling, and after a month of researching was pressed to decide on a single project, even though I wanted to do many things with many people and include them all in the process. I wanted to get more people to the local dumping sites to challenge their concepts and assumptions about waste, and at the same time wanted to establish examples of upcycling that would inspire the local community to see how waste doesn’t have to be something terrible and unwanted. As I racked my mind with questions of what to do, I had quite possibly the biggest AHA! moment of my life. I realized that what I needed to do was to throw a big party… at the dumping site. I got to work immediately to capture the idea in writing and start in the development of designs and the identification of key resources. Several days later I brought together all the people that I knew could make such a project happen and pitched to them the idea of the Trash to Treasure Festival at the Greyton Dumping Site. Now nearly 2 years later, preparations are being made for the 3rd annual festival, the eco-brick idea has spread to several communities and hundreds of families in South Africa, and just several days ago the first eco-bricks were put in place on the first full scale construction in South Africa using primarily plastic bottles stuffed full of plastic trash. I am excited and so very stoked to see that this project that I started has been truly owned by the local community of Greyton and that much is being done to ensure its continued growth and success. Meanwhile, in the states and back in my hometown of Santa Fe, I have begun working with my big brother James and his organization Only Green Design to develop a model eco-brick program in the Western World. I am looking forward to using what I learn here in Brooklyn with the DO School this year to develop these efforts of upcycling in both South Africa and the USA, and establish a strong foundation and platform in California that can manage and strengthen them as well as initiate new projects to educate people about using trash to uplift their communities and improve their quality of life while at the same time addressing issues such as environmental degradation and the loss of biodiversity. Thank you so much for taking the time to read a bit about my story. If you want to learn more then please access my websites at the links below. Cheers and aloha! 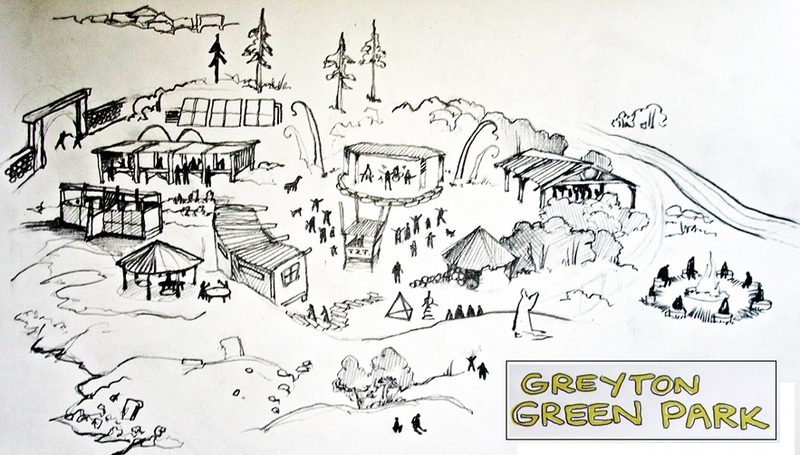 This is a drawing that I made yesterday of the Greyton Green Park in South Africa. In 2012 my friends and I organized a festival at the local dumping site to raise awareness, confront wastefulness and offer a colorful alternative to detrimental waste mismanagement. We built a stage, workshop space and composting toilet stalls from dumpsite materials and upcycled waste. Last year we built a market stall area, expanded the workshop area and stuccoed the walls of the toilet stalls. This year more constructions are being added, and the others are being renovated in time for the third Trash to Treasure Festival on April 12th. Check out, support and share my Crowdfunding Campaign in its FINAL 2 HOURS! 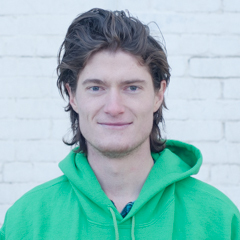 Thank you so greatly to everyone who has supported this mission of mine to pursue this fellowship with The DO School and become a better educator, entrepreneur, artist, ecological designer, musician, and holistic scientist. I have been celebrating my 6 1/2th birthday here in Brooklyn for the last two days and today I was filled with such an excitement for the gift of being alive and having so much to share with my community. I am so stoked to be here in the face of so much opportunity with you all, and with my new-found fellows from all over the world – 18 young change-makers from 16 different countries and chosen from more than 1000 people who applied. The work that I started in South Africa has taken on a mind and life of it’s own, what with people like Nicola Vernon and Candice Mostert at the reins of ongoing efforts to radically upcycle the village of Greyton into a center of transition, reconciliation and deep ecological consciousness. I brought the idea of the eco-brick with me two years ago when I traveled there and shared it through the Trash to Treasure Festivals and since then several people have taken the concept and started stuffing with it in their unique communities and contexts around South Africa. These people include Ian George Dommisse, the founder of The Eco-brick Exchange in Port Elizabeth, as well as Elize Harmony Korevaar who helped to set up a program called Wish Brix. Two days ago was marked by a milestone for Greyton and South Africa – the laying of the first layers of eco-bricks in the first substantial eco-brick construction in South Africa (aside from our composting pooper panels). The crew there is building a rondavel at the festival grounds (Greyton Green Park) for this years festival which is set to take place on April 12th. Although I wish I could be there to make rehabilitation a celebration with them this year, I am glad to give Candice and the others the opportunity to do it all themselves. The deepest of thanks to the people of Greyton for welcoming me into their home and having the courage to trust my intuitions and drive. I look forward with a ferocity to be back in South Africa with all of the new-found knowledge, goodness and determination brought about through this fellowship in Brooklyn.